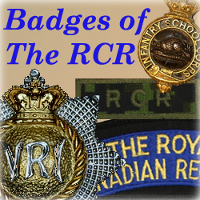 Over more than one hundred years, The Royal Canadian Regiment has issued a wide variety of badges on a common design of a royal cypher topped with a crown surmounted on a backplate of an eight-pointed star. There has, however, been changes to each of these principal elements over time, and some of the basic changes are described below. Referred to by some as a "Queen Victoria's Crown." 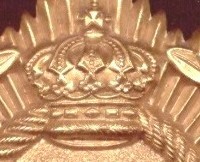 A rounded top version is found on the badges created in 1883 for the Infantry School Corps, and its square-topped variation first appeared in 1926 when the crown was "corrected" from the heraldically incorrect Guelphic crown. The second iteration of the St Edward's Crown was in use from 1926 until the 1970s, and then reappeared on badges produced in the late 1990s. This is properly the crown of Prince Albert's family, and was used during Victoria's reign. Officially, this is the crown of the Dukes of the House of Hanover, of which Prince Albert was a member, as were the British Royal family. 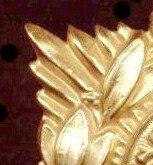 This style of crown is found on the 1894 pattern badges worn 1894-1902, and which were likely seen back in service between 1919 and 1926. The Tudor Crown (commonly but incorrectly called the King's Crown) has a rounded top. Introduced by Edward VII in about 1902 and used until the accession of Elizabeth II in 1953. Found on badges produced during the reigns of King Edward VII and King George V; from 1902 to 1919 when the return to Queen Victoria's cypher and crown were authorized. Similar to the St Edward's Crown but with a flatter top, the crown's base with alternating crosses and fleur-fe-lis, and a border of ermine. Worn by both Kings and Queens, and may be found on badges during the reigns of both King George IV and Queen Elizabeth II from the 1940s onwards. 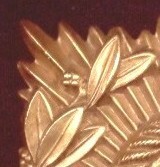 The eight-pointed star of the badge of The Royal Canadian Regiment found its origin in the earliest helmet plates of the Infantry School Corps. The basic shape was replicated in the cap badges of the same era with the "diamond cut star" which has seen a variety of minor changes in detail through the Regiment's history, some of which are shown below. Interestingly, different styles of the star have been repeated from time to time in various badge issues.